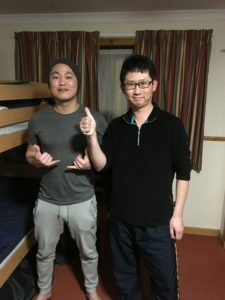 Sam Li (left) and Simon (right) were my bunk mates in Portree. I’ve been thinking a lot about the nature of commerce and of kindness. I don’t know of an economy in the world that doesn’t rely on the trading of goods and services and the gauging of value. I’ll do this for you of give you this item if you pay me a certain amount of currency. It is the nature of civilization and has been since the earliest towns and cities. But to be kind to another person, to be friendly with no other reason than to be friendly, has no economic value. It is a way to give of yourself and to receive at the same time. In Portree, I spent about an hour talking with two men from China. Simon is from Taiwan, and Sam Li is from Hong Kong. Simon is studying English in Ireland to give himself greater opportunities in his professional life. Sam is working a job in Glasgow so he can raise money for a trip through Europe he plans to take with his girlfriend in a couple of months. To a degree, the three of us were separated by language, by culture, and perhaps even by politics, but we enjoyed talking with one another and sharing each others’ stories. 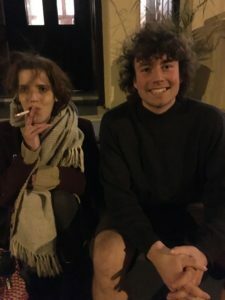 I’ve written about some of my experiences in hostels and how I’ve met some wonderful people there. They provide an environment where strangers can stop being strangers and can learn about one another. And it all starts with a kind word, a hello, a gesture of friendliness. And that one moment costs a person nothing. It’s as easy as a smile or the opening of a door. I met Nico as we waited to take the bus ride from Ft. William to Glasgow. Nico made my bus trip from Ft. William to Glasgow really enjoyable. 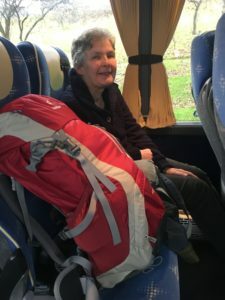 We talked only a little at first, but over the course of the three hours traveling through the beautiful western highlands we learned a fair amount about each other. Nico is retired now. She was a music teacher. Her speciality is the Scottish harp. She lives in Uist, which is on the island west of Skye. She has a daughter who is attending college in Glasgow and two sons. One of her sons has just had a son of his own, and she was planning on visiting him down in Yorkshire. I told her that I wasn’t sure if I was going to visit Glasgow or not. At that point, I was going to be dropped at the airport to see about flights to either Dublin or Amsterdam. She gave me pause about Glasgow. “The people there are really lovely. My daughter has really enjoyed living there,” she said. When it turned out that I would need to stay the night in Glasgow, I quickly learned that she was right. I’m so glad that my path took me to that beautiful city, even if it was just for a short while. In Glasgow, I stayed at the SYHA hostel, which was by far the biggest and nicest hostel I had stayed in since I had arrived in Scotland. I found myself in another fascinating conversation with a French woman, a young Canadian man, a man who said he was half English and half Irish, and young Australian woman. Tiffany and Paul made my night in Glasgow much more interesting. Scotland and has also been taking advantage of the opportunities offered by WorkAway. Alec is one of those people who emanates friendliness and has a kind soul. I enjoyed my last drink in Scottish pub with him, a fine whiskey that was extra peaty. Tiffany is a firecracker from France. She’s artistic and abrasive and absolutely charming. She was the first person that I met in the common room that night. She was trying to access the wifi and was struggling, but we got it figured out. Then she quickly said she was sorry if she had offended me. I laughed and told her that it was impossible for her to offend me. She tried continually for another thirty minutes. It was good fun. Tiffany had come to Glasgow to hear her favorite band. She had spent all of her money to get there and was going to have to figure a way to get back to France to her cat. I told her that, based on the little time I had spent with her, that I figured she would somehow make it happen. She laughed. Alicia attended school in Edinburgh for a while before returning to Australia. She had come back to visit friends and planned to go hiking in Spain. She was quiet but quite charming. I had enjoyed walking through Glasgow by myself earlier that evening, but I must admit that hanging out with the hostel crowd made my stay there so much more special. Dimitri and Jade shared a drink with me as we flew to Amsterdam. The last people that I’m going to mention I met today on the plane from Glasgow to Amsterdam. They are a young couple from Glasgow who were coming to Amsterdam for a weekend getaway. It’s a little different when you’re traveling by plane and sitting next to someone. If something goes wrong with a bus or a train, your death is not as imminent. On a plane, the person sitting next to you might be the last person you ever see. I lucked out with my seating. Then he said he guessed I didn’t know what that was being from America. I laughed and said that I had taught A Midsummer Night’s Dream in which there is a character named Snug the Joiner. A joiner is a carpenter. Jade works for Scottish Power, working the phones and handling complaints. “She’s patient. She has to be to put up with me,” Dimitri joked. I enjoyed watching how at ease they were with each other, especially as they looked out of the window at the land below. They laughed and joked and shared candy. He was the first person in my trip to buy me a drink (although I am still in debt to both to Mark from my Highland Park tour in Kirkwall and Tom from my Ben Nevis tour in Ft. William). All of the people I’ve mentioned gave me something of themselves that is beyond currency. They gave me an experience, a memory that adds warmth to those cold days, a reminder of people’s inherent goodness. Whether we’re talking pounds, euros, or dollars, that essence is so much more valuable. To all of the people that I have met so far and to all of the people that I will meet down the road, thank you for enriching my life just a little bit more. I appreciate it.